Heat oven to 375°F. In 10-inch skillet, heat oil over medium-high heat. Add mushrooms and onion; cook 5 to 7 minutes, stirring frequently, until tender. Meanwhile, microwave broccoli with cheese sauce as directed on box. Spread 1/3 cup ricotta cheese in bottom of each of 2 ungreased 2-cup au gratin dishes or individual casseroles. 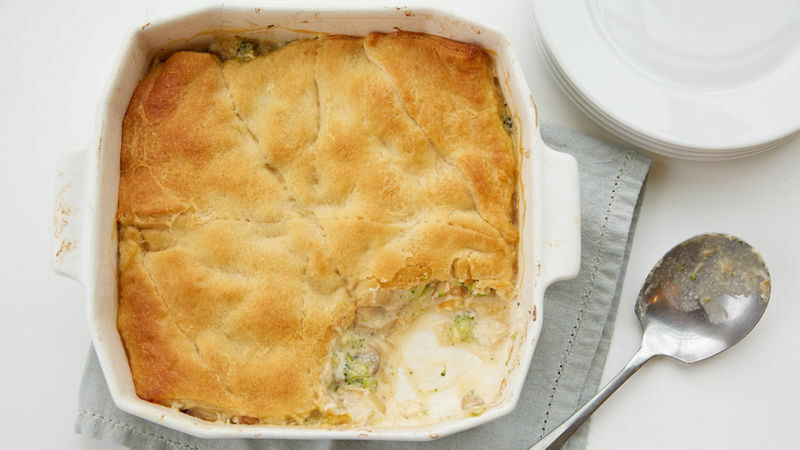 * Top each evenly with chicken, mushroom mixture and broccoli with cheese sauce. Unroll dough; separate into 2 rectangles. Place 1 rectangle over top of each dish, tucking corners into dish as needed. Place dishes on baking sheet; bake 20 to 25 minutes or until tops are golden brown and edges are bubbly. *Recipe can be made in ungreased 8-inch square (2-quart) glass baking dish. Spread ricotta cheese in dish; top with chicken, mushroom mixture and broccoli with cheese sauce. Arrange dough rectangles over top. Bake as directed.